Still time to sign up for classes! Fall is here is here and what a start of fall we've had! hope everyone faired the storms okay. I've had to push the start of classes back a week as there was no power in the studio last week. Tue, Sept 19 - Nov 21 6:15pm - 9:15pm 9 Weeks $255, 5 weeks $175. Wed, Sept 20 - Nov 22. No class Sept 27.10:00am - 1:00pm 9 Weeks $255, 5 weeks $175 ****3 spaces left. Interested in individual classes? Private Lessons now available 125.00 for 3 hours. Get in touch and I can design a class just for you. 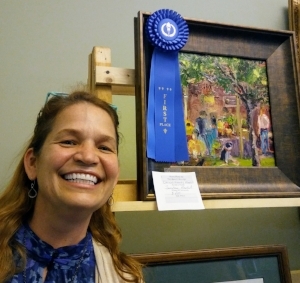 Recent Award - First Place in the Perry Invitational Plein Air Quick Paint Competition.